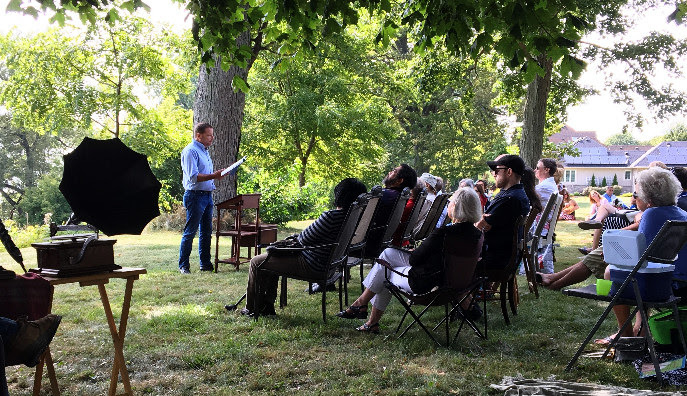 Though the year's far from over, the first of September marked the end of Woodbridge Farm's successful second year of author residencies, classes, and events. There's a chance we might still entertain a visiting writer, like we did with Max Ross, but our present focus is on planning for 2018. With this in mind, I thought it would be good to look back, recap the season, and share news of doings from our past residents. If the summer of 2016 was Woodbridge Farm's "soft launch" as Windsor-Essex's latest literary start-up, 2017 marked its swift development into an organization that provides solid programming, with participation numbers to show for it. 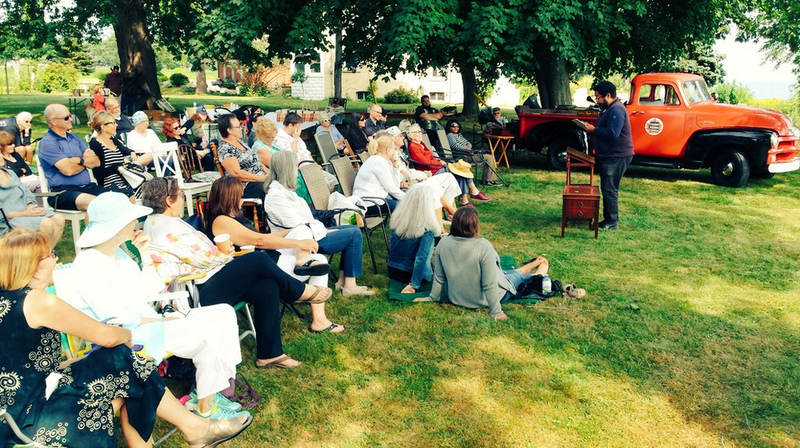 At our first outdoor reading in July 2016, to cite one example, we hosted around twenty-five guests. Last month's reading attracted around sixty-five. Encouraging growth. We hope to sustain it by continuing to add new features in manageable increments, while maintaining the style that keeps Woodbridge Farm unique. The most noticeable addition was the introduction of writing classes, both of which sold out quickly. But there were many more smaller additions and improvements. One example was our decision to handle book sales directly, rather than contract a for-profit bookseller, which increased the reading series' revenue and sustainability. Though changes like this might not be as evident, they make a great cumulative difference. Almost all of these small improvements came as corrections—where we learned, quite humbly, from missteps made in innocence. My favorite example was the idea to space two thirty-minute gaps between each of an event's three readings. I made the mistake of implementing this at our June lawn party. When planning it, I thought those thirty-minute pauses would encourage a relaxed atmosphere, allowing time for people to mingle. But I was wrong. Most seemed anxious for the show to continue; a few got up and left. My friend Tim, who's been playing gigs for decades, said there's a standard rule in live music: never leave the stage for more than ten minutes. Five is better. But having no breaks works, too: that's how August's event was structured, and it flowed well. Everyone I spoke with enjoyed our five part, barrel-through pacing—i.e. : I. welcome -> II. intro -> reader -> III. intro -> reader -> IV. intro -> reader -> V. conclusion. It's the model we'll adopt going forward. I mention this, in part, to point out two strengths that make me enthusiastic about Woodbridge Farm's future. Both have to do with the quality of our audience: first, they offer smart feedback; second, they've shown unwavering support even through this early process of improvement and expansion. It speaks so much to the quality of those who form our core. In light of this year's success, planning is already started for the 2018 season. While it's too early to make any announcements, we'll be expanding the geographic range of authors invited to the retreat and reading series. We're also in discussion with supporters and regional organizations to develop our existing programming and establish new ties with the community. In other words, expect surprises. 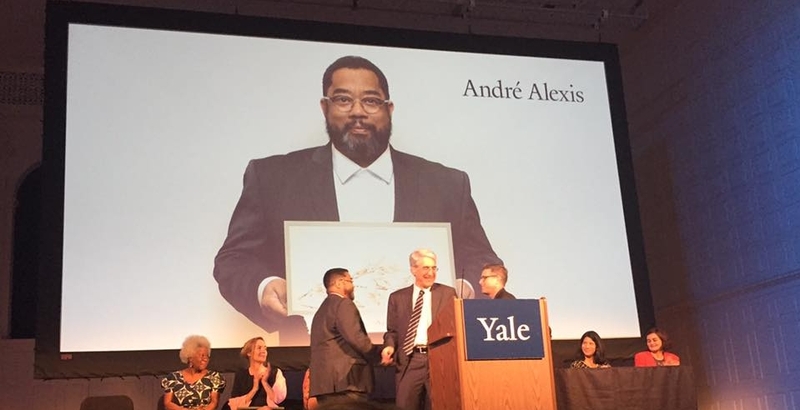 Earlier this month, Yale University president Peter Salovey awarded the Windham-Campbell Prize to our August 2017 writer-in-residence, André Alexis, at a ceremony in New Haven, Connecticut. Norwegian author Karl Ove Knausgård, best known for his five-part novel, My Struggle, was the evening's keynote speaker. Alexis is the third-ever Canadian to win the award. Soon after, he was back in Toronto with his fellow 2017 Giller Prize jurors—including Lynn Coady, Nathan Englander, Anita Rau Badami, and Richard Beard—for the announcement of this year's prize longlist. Around the same time, Alexis' inclusion in Granta's forthcoming issue on Canada was made public. After a promotional tour for her collection First Things First: Early & Selected Stories, including stops in Montreal, Toronto, and Hamilton, Diane Schoemperlen is back home in Kingston, Ontario, where, among other things, she's busy creating new collages. If you're interested in reading an excellent essay on the form, only about a dozen copies of her limited-edition chapbook, One Things Leads to Another: An Essay on Collage, are left. You can order them from Diane directly, or through our online store. Diane will be participating in several writers' festivals this autumn, including Toronto's International Festival of Authors and Kingston Writers' Fest. A magazine piece that journalist Ryan Goldberg worked on while visiting us was published in Texas Monthly this past July: "Drug Runners," a deep dive into the world of the Tarahumara First Peoples of Mexico, their culture of long-distance running, and how this talent has been exploited by drug cartels, was selected among that week's best articles by Longform. Kim Fahner, our August 2017 resident, continues her role as Poet Laureate of Sudbury, Ontario. In a few short weeks, she'll be launching her latest collection of poetry, Some Other Sky, published by Windsor's Black Moss Press. Windsor-Essex locals should keep their eyes open for an announcement about this year's Poetry at the Manor event, which should be happening around mid-October. Kim is scheduled to present there with several other poets laureate from around the country. The evening, as ever, will be hosted by the indomitable Marty Gervais. 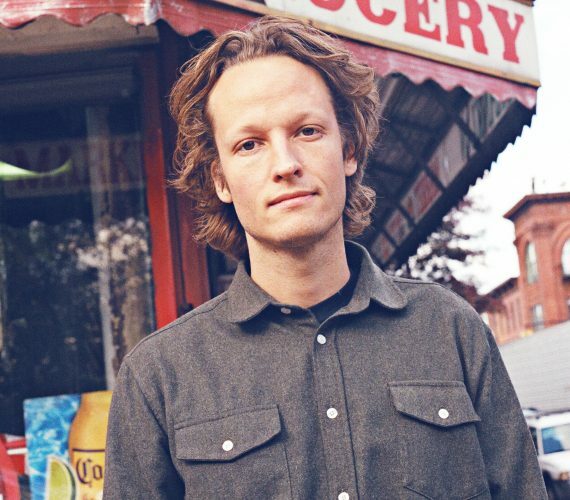 Up in Toronto, Jesse Eckerlin began his masters degree at the University of Toronto's Centre for Comparative Literature. He completed his bachelors in literature from the same university earlier this spring. On Sunday, a record crowd came out to enjoy an afternoon with Giller Prize-winning author André Alexis, along with local writers André Narbonne and Dorothy Mahoney. The weather was perfect, freshly roasted coffee was served by Red Lantern Coffee Co., and Stephen Phillips played early jazz of the 1920s from the bed of his 1945 Chevrolet. The mood of the afternoon was as bright as you'd expect, carried by laughter and conversations around the book signing table. Next came André Narbonne, a writer, poet, and professor of literature and creative writing at the University of Windsor. He read a fable that was originally published in the Windsor-based literary journal Rampike, then a poem from a forthcoming collection due out this fall from Black Moss Press. One of the things I find fascinating about Narbonne—who's quickly become a valued member of the region's cultural community—is that he arrived relatively late to academia, having first labored as a maritime engineer. He was living out of his duffel bag when he arrived in Halifax on a damaged tanker in the mid-eighties. Years later, he completed two degrees in English at Dalhousie University, before going on to earn his Ph.D. His early experiences helped add remarkable authenticity to his story collection, Twelve Miles to Midnight, which was recently named a finalist for the Danuta Gleed Award—a prize that recognizes the best debut short fiction collection by a Canadian author. After the readings, we socialized, enjoyed refreshments, and had our books signed. Then door prizes were drawn. One of the winners, Rev. Morley Pinkney, left with a copy of David William's new novel, When the English Fall, along with the latest issue of The Walrus, and a gift certificate for dinner at The Main Grill & Ale House in downtown Kingsville. Two others won similarly cool swag. Most stayed to mingle and listen to music until Stephen packed up his truck. Quite a few said it was the region's most memorable literary event of the year. A great portion of its success is thanks to our excellent participants, but also to the support the community. First and foremost, we're grateful for our hardworking volunteers, especially Chris Andrechek, who handled book sales; Stephen Phillips, who shared his rare music; Sharon Hanna and Philip Munroe, who assisted with a number of matters; Kirk Munroe for serving as our parking officer; and others. Huge thanks to Craig Marentette of Red Lantern Coffee Co., who'll be slinging java at all our future parties; the excellent independent businesses who donated gift certificates for our raffle—The Butcher of Kingsville, Merli's Coffeehouse & Eatery, and The Main—and the publishers who supplied our book table: Windsor's own Black Moss Press and Palimpsest Press, as well as Coach House Books of Toronto. Thanks also to the staff of the Pelee Island Winery, who graciously offered their event space as an alternative rain location, and to the Kingsville BIA, Mayor Nelson Santos, and Councilor Tony Gaffan for their outreach and advice. Finally, we owe a debt of thanks to all our friends in the local media, including Craig Pearson of The Windsor Star; Jerome Vaughn of WDET, Detroit's NPR affiliate; Colin Côté-Paulette of CBC Windsor / Radio-Canada; Nathan Swinn of CBC's Afternoon Drive; Louann Geauvreau-Karry of The Kingsville Reporter; and Nelson Santos of the same. But most of all—thanks to all who joined us. In just two short years, you've helped Woodbridge Farm's events and sold-out classes grow to become the highlight of Windsor-Essex's summer lit scene. In the coming weeks, I'll post a more comprehensive look back on the season as a whole, with a few words about planning that's currently underway for next summer. Until then, enjoy a restful Labor Day weekend. We're thrilled to host André Alexis, among our nation's most celebrated novelists, at next Sunday's lawn party and outdoor reading at the farm. He'll be joined by two of Windsor's best loved writers: author, poet, and professor André Narbonne, whose most recent short story collection, Twelve Miles to Midnight, was shortlisted for the Danuta Gleed Award; and the widely-anthologized poet Dorothy Mahoney. 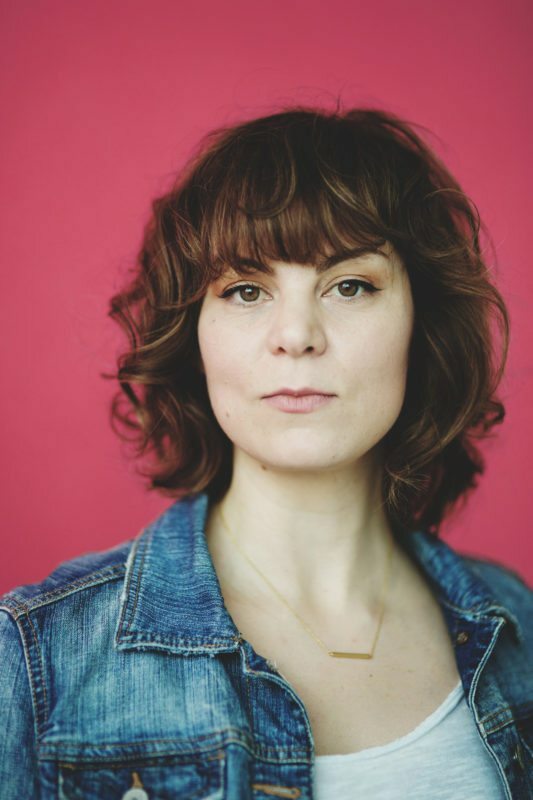 Come out for this rare opportunity to meet an author The Windsor Star recently named "the current toast of the Canadian literary scene." Our inaugural Random Review Copy Raffle, where everyone gets a chance to win books. We'll be taking very short breaks between each author's presentation, then enjoying the rest of the afternoon under a lazy shade. It's our last outdoor event of the summer. Don't miss out. and new works by Margaret Atwood, Diane Schoemperlen, and others. For more on Alexis, please see his bio on our Residencies page. Attendees of Diane Schoemperlen's June memoir master class raved about the instruction, welcoming atmosphere, intimacy, and food. To reserve your spot, email woodbridgeretreat@gmail.com. Seats are filling quickly. Most of our ancestors spent their summers in a stoop. Not all did. Some rode horses into other horses, sniffed game trails, threw clay, or cast nets, but, for the preponderate number of peasants in our collective line, stooping was definitely the most popular pursuit of the season. And why not? Ancient grains don't reap themselves. We still stoop today, of course, but it's often over a computer, for want of a posture-correcting Aeron chair. Slouching is the new stooping, and its practice extends far beyond the month of July. Whether a life of slumping is progress over several months in full-stoop, intermingled with generous periods of genuflecting, skulking, folk dancing, fleeing, and kowtowing, I'm not smart enough to say—but it does feel good to occasionally return to your roots. My friend Max Ross discovered this during his trip here. I took him up on his offer to help me in the garden. We stooped to harvest garlic—over a hundred bulbs. Then we graded them on the gravel drive, before trimming their stems and roots and hanging them to cure. Honestly, I did the trimming and hanging on my own. After zealously throwing himself to the labor of garlic plucking, which lasted a heroic ten minutes, Max preferred to spend the remainder of the day on a couch, napping and reading Knausgård. We all have our own ancestors to impress. I've been friends with Max for nearly a decade. We met at New York University's graduate program for fiction, where the two of us attended workshops and classes together. His fiction, which is always very funny, has been published in several well-regarded journals, including American Short Fiction, The Common, and elsewhere. His essays, reporting, and reviews (as funny) have been featured in the New York Times, Boston Globe, L.A. Review of Books, and online at The New Yorker. My favorite of his work was written for the latter: a short, Talk of the Town-style piece about a radically egalitarian soccer organization in Minnesota, where Max was born and raised. He currently lives with his girlfriend in San Francisco, a shining city where agriculture is something its citizens expect to be sustainable and trucked in from elsewhere. One Saturday afternoon during his week-long stay, the two of us enjoyed the company of the Gombai Art Collective, a loose fraternity of local painters. They held a gathering by the lake. Though Max spent the majority of their visit reading (more Knausgård), he looked up when someone noticed an object falling from the sky. It splashed down a mile offshore. One painter described it as a huge, half-deflated balloon, "but with heft." Another claimed he'd conjured it through sheer force of mind. Debate ensued about whether we should swim out to identify the thing, which barely floated. But then it was swallowed by the lake. So we barbecued sausages, eggplant, and summer squash instead. The latter two items were harvested from the garden, which is now in high season. These days my neighbors, parents, and I are enjoying nightly helpings of beans, tomatoes, sweet onions, cucumbers, beets, watermelon, and more. There's so much produce, in fact, that I might put a stand out by the road. That would mark a first, and reestablish the Woodbridge Farm as a working farm, rather than just an ancestral place name. Hawking produce is something I've thought of doing for years. It's an honest ambition—the sort of dream you stoop to. Yesterday was one of the hottest June days in the history of the Detroit-Windsor region. Temperatures reached well into the 90s. But on the lake in Kingsville, just outside the concrete sprawl of the city, it was cool enough for at least one woman to don a sweater. She was the exception among the fifty-plus people who came to enjoy readings from authors Diane Schoemperlen, Marty Gervais, and D.A. Lockhart—yet everyone felt the difference. A lakeside breeze makes even the swampiest summers tolerable. In all, we really couldn't have asked for a better afternoon. Each of our guest authors entertained in their own way, while everyone socialized and kept refreshed during breaks. Our friend Tim Swaddling played old 78s from the 30s and 40s, dutifully flipping sides and changing records every few minutes, while the folks from Biblioasis served pie. D.A. Lockhart started us off with some light poetry. He read pieces from a previous collections, then a sonnet from a forthcoming book he and other poets in Windsor's so-called "Group of Seven" are publishing this fall, under Black Moss Press, in celebration of Canada's 150th anniversary. Much of Lockhart's work seems grounded in the traditions of the Leni Lenape, which I find fascinating. A member of the Moravian of the Thames First Nation, located outside of Chatham, he currently lives in Windsor with his wife Emily and their young son. About a half-hour after Lockhart read, historian Sharon Hanna introduced Windsor's Poet Laureate, Marty Gervais. Always a crowd favorite, he told anecdotes and recited a few of his more recent poems, then turned to a fascinating passage on how Windsor's car culture contributed to the destruction of the city's architectural treasures. The section was read from his forthcoming memoir, The Disappeared: Five Days Walking the Five Towns, out from Biblioasis this fall. Finally, our guest and headliner, Diane Schoemperlen, read the preface of her newest full-length book, First Things First: Early and Uncollected Stories, also published by Biblioasis. The essay brought us through Diane's career as a young writer, ending with a reflection on the lessons she's learned. Chief among them: Be stubborn. "Whereas confidence is a flighty temperamental quality that will always wax and wane," she read, "stubbornness is a good solid thing, not always wise but certainly reliable, steadfast, and dependable." In addition to the launch of First Things First, the event was also (in an appropriately relaxed way) the launch of our new press, Woodbridge Farm Books, and its first title: One Thing Leads to Another: An Essay on Collage, also by Diane. They all came with hand-made collage bookmarks by the author herself. Each is unique. Both her book and chapbook sold well, as did titles by Daniel and Marty. Always a welcome thing to see people loaded down with new reads. Couldn't make it out? Want a copy of Diane's chapbook? You can order it here. Only the next 20 come with bookmarks—those are all we have left. And once the limited run of 100 copies is finished, it's finished for good. So snap these collectable items up. All the other authors' books are available online and at independent bookstores near you. Thanks again to Biblioasis for partnering with us on this event and providing refreshments. Many asked when our next lawn party is taking place. Mark this in your calendars: Sunday, August 27th from 3 - 6 p.m. We'll be joined by 2015 Giller Prize-winning author André Alexis, best known for his novel Fifteen Dogs, as well as local author André Narbonne and poet Dorothy Mahoney. Big cheers for the authors. Big cheers to all those who came out. It was an excellent way to cap off a rich, successful weekend of literary events, following the sold out, full-day workshop on memoir writing that Diane held on Saturday. Now time to spring back to the desk, with some pauses for tending the farm. More news soon. We went and started a very small press. 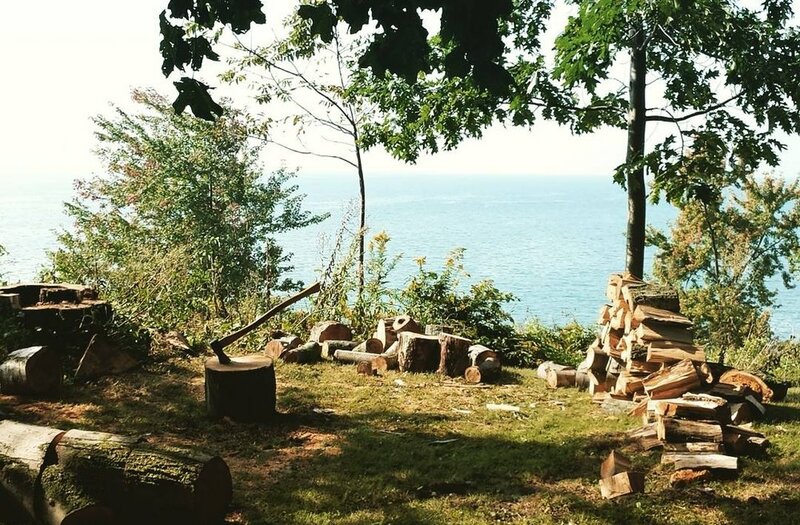 Looking back, everything was growing toward it: the residencies, readings, workshops. What launched the effort, though, was more of a lark: over beers, I spoke with a friend about putting out a chapbook series. He agreed: it'd be fun. So I asked a few other people—people that might be able to help—and they were keen on the idea, too. To guarantee full creative ownership, we decided to do it ourselves. Not uncommon. But so now here we are in early June, after several weeks of planning and collaboration, with the fruits of that labor: Woodbridge Farm Books' first title, "One Thing Leads to Another: An Essay on Collage," by the brilliant, GG Award-winning author Diane Schoemperlen. It's the first in the aforementioned series that we're calling Marginalia: Authors on Their Pastimes & Hobbies. Four of us hand-bound the books, which resemble very fine pamphlets, over a beautiful Sunday afternoon. When the job was done, we went for a swim in the lake and grilled hamburgers. The edition turned out beautifully thanks to two amazing women: Diane, who not only wrote a captivating (and occasionally quite funny) essay on how collage making influenced her vocation as a writer, and vice versa, but also included original, black and white interior illustrations (including of her own work); and talented Windsor-based artist Julia "Julie" Hall, who designed, hand-lettered, and illustrated the cover. The generous use of negative space is something Julie's known for. Fits the tone of the series perfectly. It's often easy to overlook the particular genius of professional typesetters. Most people just recognize bad typesetting; and then often only in an abstract sense: the page doesn't look quite right, or looks cheap, messy. That's not the case here. The reason—the reason for this project's realization, really—is thanks to my friend Chris Andrechek, a master of interior book design. Again: clean, minimalist, perfect. For now, it's hard to imagine publishing anything more grand than these crisp, hand-made items. At least for the foreseeable future. The cost of running a small press—both in terms of time and money—is far greater than I'd care to spend. My focus is on my writing. But we'll see. Might sound like hedging. It isn't. Just being careful what we wish for. 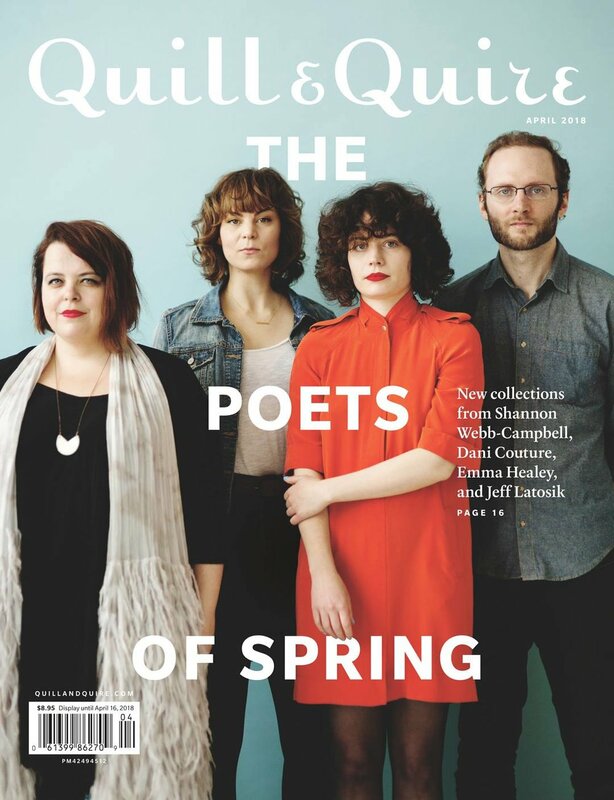 Because, listen: this fun, collaborative effort, which is currently quite manageable, offers all the pleasures of publishing without many of the downsides. In other words: no throat-clenching heartbreak, all the joy of bringing a thing to life. We're starting small, devoted to quality. You can buy our very first edition here. All are signed, and the first 20 copies come with Diane's colorful bookmarks. Each one is unique. This Sunday marks the year's first big lawn party of the summer. Biblioasis, which appears on the verge of becoming a medium-sized press (with all the acclaimed authors and books needed to carry that prestigious, hard-won designation) will be there to launch Diane's latest book, First Things First: Early and Uncollected Stories. She'll be joined by our friends Marty Gervais, the Poet Laureate of Windsor (and memoirist, historian, publisher, photographer, journalist—the list of his talents goes on and on); and D.A. "Daniel" Lockhart, another local, multi-class literary star: poet, author, publisher. You can find details on the party here. If you're around, I hope you'll come and celebrate Biblioasis' launch with us, and enjoy the day.